But dedicated apps made tracking cumbersome. I enjoy these areas, which is why I want to record them. Reporting my experiences should also be fun. And easy. I needed one app to record them all. DayOne has earned that spot. Within the app, I created a tag for each of these categories and simply capture my experiences there. DayOne syncs across all my devices, so I can search by tag or simply look backwards in time to be reminded of past experiences. As an added bonus of tracking these activities, I'm developing the habit of journaling other moments as well. Today is the final episode of this season's Serial podcast. Along with 5 million other listeners, I'm crazy stoked about discovering how Sarah Koenig manages to wrap up this intriguing story about Adnan. But unlike watching the final episode of Sons of Anarchy or Breaking Bad, I have very few people in my immediate circle of connections to discuss it with. Sure I can discuss in online in forums and on Twitter and even listen to a podcast about it, but being a podcast junkie, I often can't understand why everyone else isn't listening to podcasts. The debut of the iPhone in 2007 promised to improve things, but it still took years of app development and faster data networks to get us where we are today: Anyone with a smartphone and the willingness to try can probably, with some help, play a podcast. But if you’ve ever attempted to connect a podcast app to your car’s sound system via Bluetooth, I suspect you’ll agree with me that we aren’t there yet. Podcasting continues to fail my basic technological test—it’s still a lot harder than turning on a radio. And my current recommendation for new podcast listeners is Working by David Plotz. In the tradition of Studs Terkel, Plotz interviews people of various professions about what they do all day. The conversation with Stephen Colbert is especially entertaining. I'm off to listen to Serial! I threw away my Franklin Planner this week. Mine was old school, pre Franklin Covey merger. Fresh out of college, I remember receiving my first Franklin Planner and going through the day-long training. Towards the end of the class, our instructor had us go out 21 days and add the task of sending her a note (not an email, an actual paper note) describing how our first three weeks using the planner were going. A colleague I worked with who was 20+ years my senior flipped his planner to the next day and began writing more immediate tasks he planned to accomplish back in the office. I asked him why he didn't do the exercise as instructed, and he said, "I have no intention of sending her a note." I admired his thought process, and while that incident has stuck with me all these years, I still struggle with being selective on what actually gets added to my Omnifocus inbox. I remember upgrading my planner from burgundy plastic to navy blue leather, but it's been years since I've ordered a refill or used any form of a paper task manager or calendar. I still see others who do, but they are becoming more rare every year. I've moved my old planner from office to office clinging to it like a security blanket, but as I packed for an my next move it was time to let it go. I'm lucky I got to spend some time with it saying goodbye. I paged through it and kept some of the insides, the most important being my mission statement - written in 1993, printed on a dot matrix printer, and signed by Stephen R. Covey in 2003. I was pleasantly pleased to discover how much in alignment I've been living what I wrote 21 years ago. Not achieved it, but living it. I retyped my mission statement in nvALT in it's original form, resisting the urge to tighten it up and remove a few cliques, and I took a picture of it to store in Evernote. 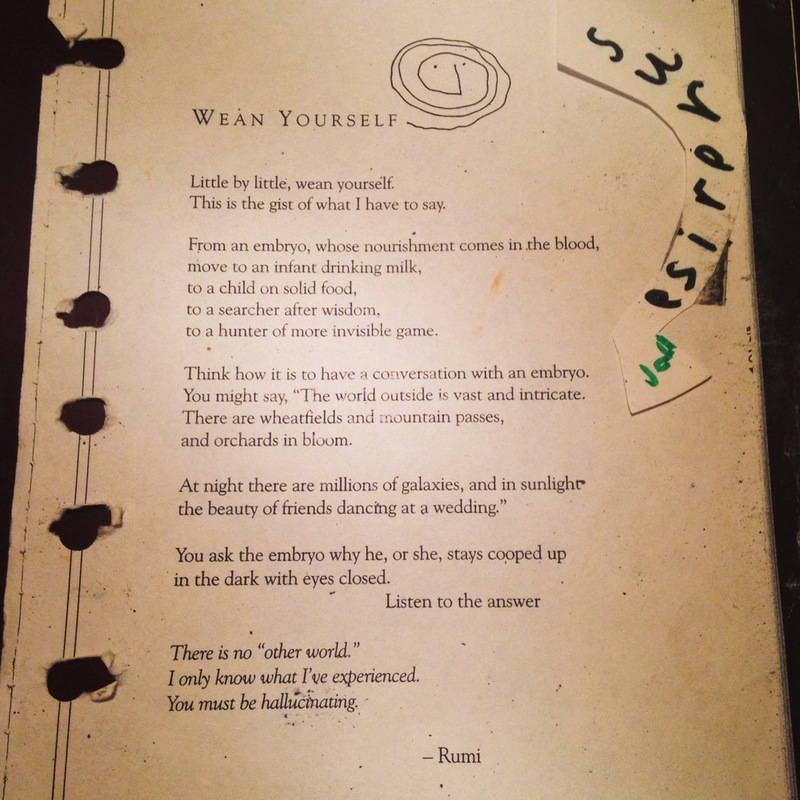 I also found this little gem - a poem from Rumi via Gordon MacKenzie's Orbiting the Giant Hairball. It seemed like a perfect summary of this transition of letting go. I carried this poem in my planner for years.